I hadn't visited Lough Curra in I guess 4 years but today the dog, the wife and I were blessed with bright sunshine for a relaxing ramble to its summit. Towering buttresses of naked red sandstone rocks hanging above us, snow filled gullys leading the eye up to the rocky summit of Galtymore, two red dots of spidermen slowly ascending one. Mr Joyce also gives the following explanation of the original name for the Galtys which I hadn't come across before. 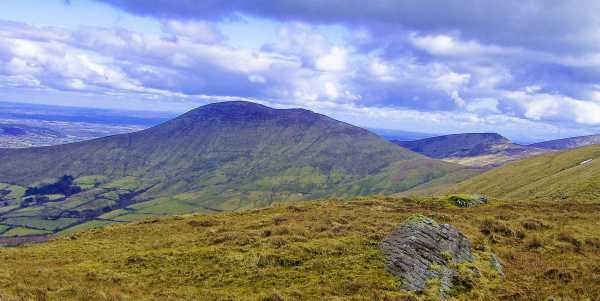 "The Galty Mountains were anciently called Crotta-Cliach or Slieve-Crot or Slieve-Grod, which name is still preserved in that of the old Castle of Dungrod, in the Glen of Aherlow, near Galbally.